record value, analytical approaches used and qualifications required. See diagram showing high "u"
See diagram showing high "d"
A number of overseas textbooks list other methods, however they can be included under one of the above headings. For example, cost and residual methods come under the summation method in Australian practice. If the direct comparison method is not suitable then either the summation or the capitalization method is used. Which one? a home unit in a strata scheme where the majority are owner occupied: direct comparison. a home unit in a strata scheme where the majority are leased out as investment properties: capitalisation. investment properties such as retail, commercial and industrial: capitalization. In this part we are concerned with the direct and summation methods. 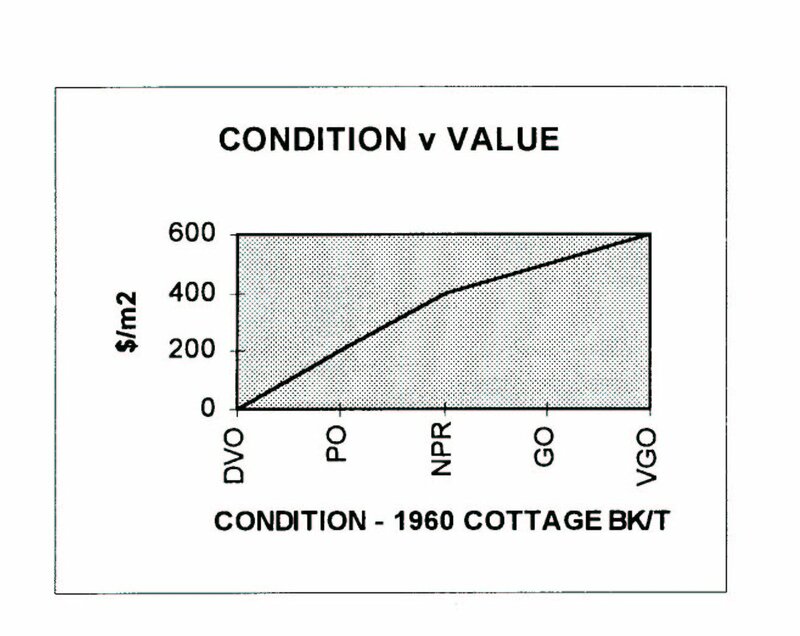 Scales of value are useful tables or graphs constructed from sale evidence for the important variables determining market value for example, age (architectural style), materials, condition, and size. By analyzing sales with the summation method the value/m2 of the improvements against vintage is found. The values/m2 are plotted on a graph for the subject house, in good order, with standard materials and standard area. Such a graph is shown in the diagram below. 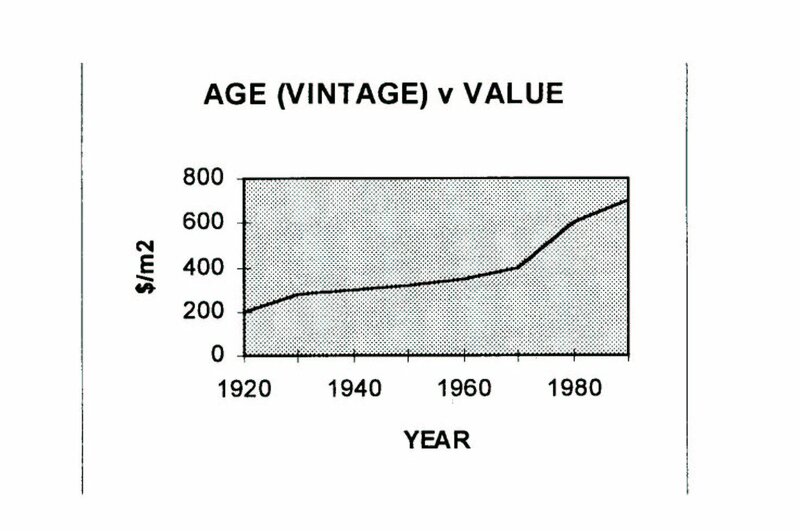 The value for an age other than that revealed by sales can be interpolated from the graph. 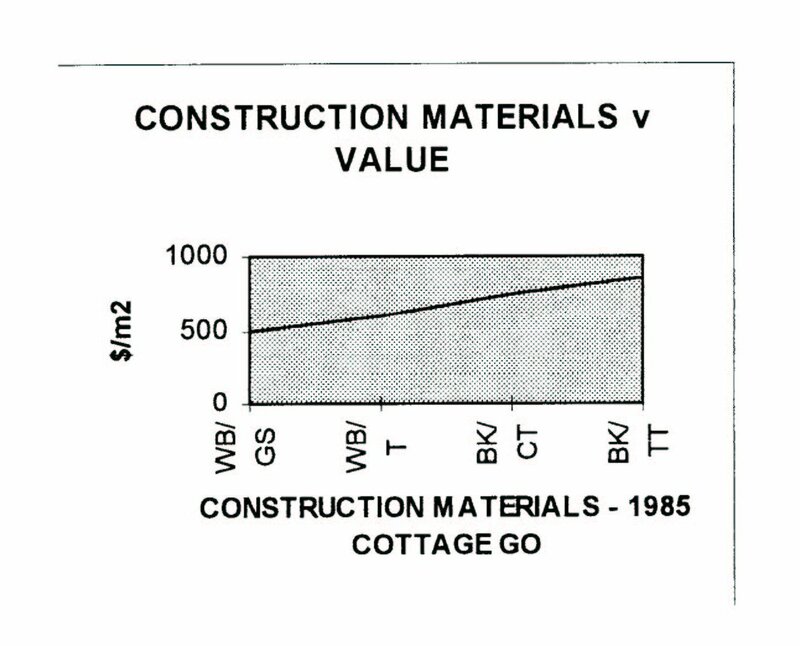 The diagram below shows a scale of values for brick/tile, wood/tile, and wood/galvanized steel houses in which area, age and condition are held constant. Values for vintage/materials not revealed by the sales can be interpolated. The diagram below shows a scale of values for very good order (VGO), good order (G0), needs paint and repairs (NPR), and poor order (PO) conditions. Materials, age and area are held constant. The diagram below shows a scale of values for houses of 50,100, 200, and 400m2. Condition, age and materials are held constant. The value/m2 falls with an increase in area as fixed costs and expensive "one of'" features (such as kitchens and bathrooms) are averaged over a larger area. The age of the building should be stated as vintage (year built) rather than "x" years old. This Is because "x" years old is relative to the date of the valuation report and therefore, requires knowledge of that date. Further, it is more difficult for the valuer to know and relate the date of construction with the style and architecture of historical periods. See the table in the appendix that shows, as a general guide, the age of buildings by the materials used. Architectural style can be one of the most important variables of the market value of houses particularly, in heritage areas. It is an example of "art' being an important part of valuation system. Residential houses should be classified and dated according to architectural periods for example, art nouveau, art deco, modern, Californian Japanese, and West Cost Bungalow. This is more important than the year of construction . Consumers of housing have changing attitudes to architectural style and an unpopular style today may be popular tomorrow. Victorian terraces in Sydney were particularly unpopular in the early 1900s when it was considered desirable that houses should be freestanding. Compare this attitude with their popularity today. Classifications of this nature should be constructed to suit a certain locality. For example, what may be a good classification for the North Shore of Sydney may be a poor classification for the inner suburbs of Sydney. Residential houses were constructed during distinct chronological periods, such as the "immediate post war" period or the "depression period". Subdivision of houses into historical periods is useful as it reduces the number of categories needed and groups houses together into similar design, architecture and materials. See appendix for a breakdown of architectural styles together with circa based on that used by the South Australian Valuer General. Painting and non structural repairs are required. Reasonable condition but will require painting soon. Above average maintenance and condition. For example, well kept by one owner. Condition relates to curable obsolescence until it falls to the level of demolition value only. At that stage, it becomes incurably obsolescent and the building has no value. Incurability reflects the cost to cure. If substantial problems arise with the structural integrity of the building (for example with the footings), although cure is possible, it is too costly and the owner would be better off demolishing and rebuilding. Finish describes the extent and quality of items, workmanship, and attention to detail in the house. It is measure of the quality of construction (for example, Tallowwood, Tasmanian oak or Jarrah floors) as well as the number and quality of prime cost (pc) items. PC items are those fixtures which are included at cost by the builder. That is, in the building contract they are not separately costed as the actual cost is not determined until date of purchase. This also allows the owner some flexibility in the type, quality and extent of PC items to be included in the house. kitchen sink and laundry tub. The valuer can usually determine finish by the attention to detail. For example, there is a rule of thumb that state; "if the front door knob is expensive, then the finish for the rest of the house is also of a high standard". The main part of building under a full roof, fully lined and ceiled. A flat roofed addition (lean to) to the main part of the house. It may or may not be fully lined and ceiled. An open structure attached to the house. Generally, not lined and ceiled. An outside concrete slab attached to the building. 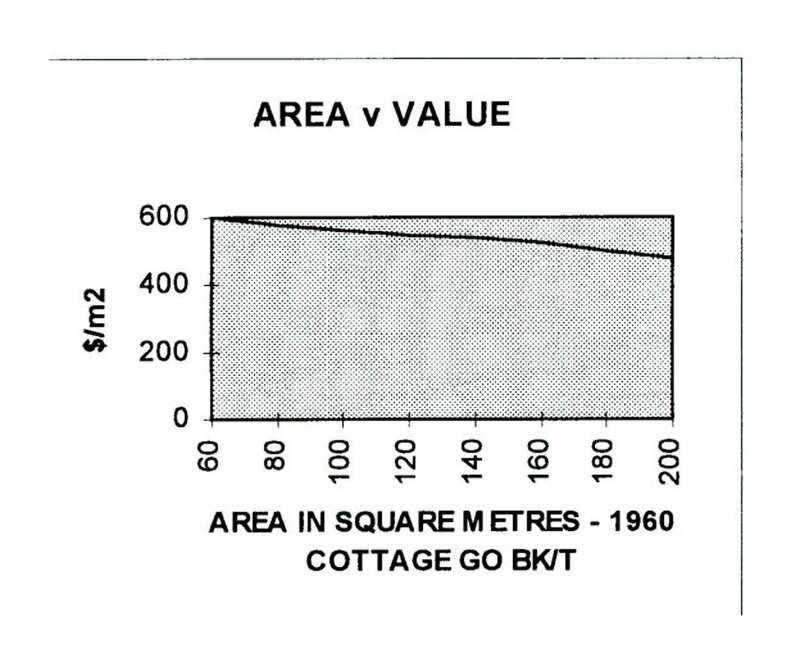 Land value is determined using the direct comparison method as shown above or by analyzing the value from sales of houses using the summation method. The main component of land value is whether or not a house can be built on the land. Therefore, the extra or marginal value of land over and above that value is less per square metre than the basic building block. condition of the road and access to the block.